It's no secret that I'm a big fan of what Jonathan Ward and his talented team at ICON are doing, and it's also no secret that there's no way I can grow enough kidneys to ever own an ICON product. Well, until now, since ICON is making automotive art prints now. Those aluminum ones aren't cheap at $1450, but they're only making 10 of each of the six designs, which include a 356, the lovely side exhausts of a Cord, a 50s Mercedes racer, and other icons of automotive design, distilled down to their most essential (partially by Jonathan Ward's very own hand), in ultra high-contrast silver on black. ICON is now proud to announce the ICON Auto Art initiative. 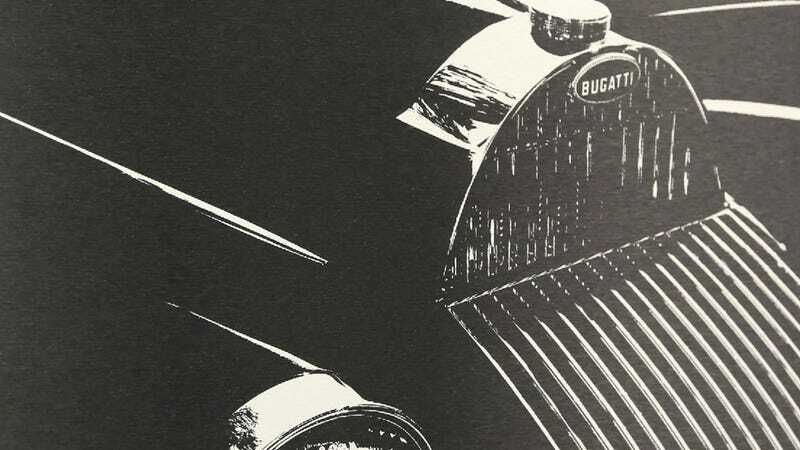 The initial launch will include a collection of six pieces honoring the 1920 Bugatti Type 13, 1939 Bugatti Type 57 Volf & Ruhrbeck, 1937 Cord, 1952 Mercedes SLR, 1938 Talbot Lago Figoni et. Falaschi T150SS, and the Porsche 1962 356B. There will be two mediums offered. The stars in the series will be a limited edition of ten aluminum 13 5/8" x 9 1/8" panels, followed by a series of classic press-printed 13.5" x 20" silver prints on thick stock black paper. Each piece starts with the original photo, which is then modified as I hand draw the most basic form to capture the pure essence of the design. Next, in partnership with the aluminum wizards at Neal Feay, the traditional processes of silk screening and anodizing are combined in a novel fashion, to fuse black pigment into the brushed aluminum surface. The ½" thick 6061 aluminum is precision machined with an inset groove for wall hanging, as well as blind-taped for desk display with the supplied stainless bolt. Each is packaged in a bespoke maple box with the ICON lizard laser etched onto the face. Black-paper prints are much cheaper at $75, too. I saw some of these when I visited the ICON factory a bit ago, and they are remarkably striking. So now you know what to demand of Santa when you catch him in your home-built hydraulic Santa trap.